Women need to gain enough weight in pregnancy to ensure that their baby is born at a good birth weight, as that gives the baby the best chance of feeding well and growing and developing normally. 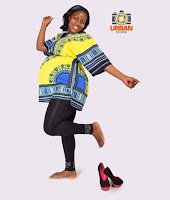 Women who are themselves short and thin, those who may have been born at a low birth weight, and those who smoke and who gain little weight in pregnancy, are at greatest risk of having a baby with low birth weight. Women under 20 are at greater risk of having low weight gain in pregnancy compared to older women. It is important that everyone gives a clear and consistent message about eating well in pregnancy first and foremost and takes a considered view of weight gain in pregnancy, which is likely to vary for each woman. If a woman has had an eating disorder, it is important that extra support and advice are sought from a GP or pediatric dietitian to ensure that everyone is clear about whether the woman is gaining enough weight, and that the pregnancy is carefully monitored. In the UK we do not have specific guidance on the amount of weight that should ideally be gained during pregnancy, but it is generally agreed that women who enter pregnancy underweight should be encouraged to gain more weight than those who enter pregnancy overweight or obese. The amount of weight gained will be different for different women, and the most important thing to encourage is a good diet rather than a specific weight gain. An average weight gain of about 12 kg (just under 2 stone) is often used as a guide, but young women who are still growing, women who are having multiple births, or those who are very thin, or very fat, when entering pregnancy should be given individual advice. Being overweight in pregnancy impacts on the health of pregnant women, the delivery, and the health and well being of the baby. Women who enter pregnancy overweight are more likely to gain too much weight in pregnancy, and find it harder to lose it afterwards. In the UK there is guidance for health professionals on managing weight in pregnancy for women before they become pregnant, or if they are overweight or obese during pregnancy, and to support overweight and obese women after pregnancy. Being overweight or obese increases the risk of developing gestational diabetes, a disorder that develops in about 2% to 6% of pregnancies leading to raised blood glucose levels. Other risk factors include: having a family history of gestational diabetes; having a first degree relative with diabetes; or coming from a south East Asian or African-Caribbean ethnicity. Women with gestational diabetes are more likely to deliver larger babies and are usually advised to manage weight gain in pregnancy and to eat a diet which is rich in fruit and vegetables and wholegrain cereals and to limit intakes of sugars, particularly from soft drinks. Dietary counselling is advised for women who have previously experienced gestational diabetes or who are at high risk. Much of the weight gain is water, and this increase in fluid is needed to ensure that there is a good flow of blood and nutrients from mum to baby through the placenta. Some weight is gained to provide the energy stores for breastfeeding, and breastfeeding is the ideal way to protect both the baby’s and the mother’s health and for the mother to regain a pre-pregnancy figure. Eating well in pregnancy is one of the most important things you can do to give your baby the best start in life. Trying not to gain much weight may mean that the baby is deprived of the energy and nutrients needed to develop. Gaining the right amount of weight does not mean having a bigger baby which will be harder to deliver. It is a myth that a smaller baby means an easier delivery. Every woman has a different birth experience and the most important thing is to eat well and have a healthy baby. Dieting in pregnancy is never recommended. 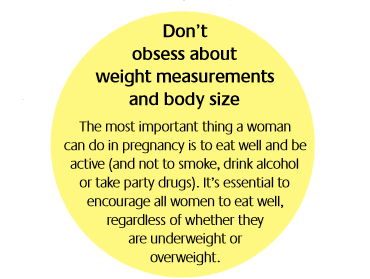 If women are worried about their weight, the best advice is to follow the guidance in this resource about eating well during pregnancy and to talk to a midwife or GP after the birth about accessing support on how to lose weight effectively. Research suggests that just six months of breast- feeding can reduce the risk of obesity in women in later life, as well as reducing the risk of breast cancer. Back ache and leg cramps may be less of a problem. It may help reduce the risk of some complications in pregnancy such as gestational diabetes and pre- eclampsia. 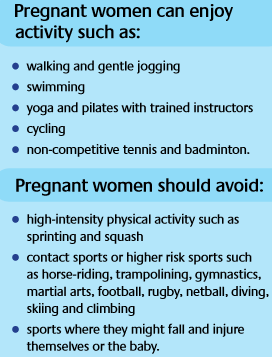 Most moderate exercise is safe in pregnancy, but women should check with a doctor that the sort of activity they do is safe. It is a good idea to do at least 30 minutes of some sort of moderate activity every day in pregnancy. At the least, encourage everyone to walk for at least 30 minutes a day outside. For other activities, encourage women to wear a good support bra (without under wiring) when exercising, and to drink plenty of fluids. If there is any discomfort, dizziness, pain, breathlessness or exhaustion when exercising, women should stop the activity and seek advice.